(Newser) – Her heroines may have found advantageous marriages, but Jane Austen never did. That's precisely why records detailing the Pride and Prejudice author's impending nuptials to two separate men are so remarkable, according to historians. 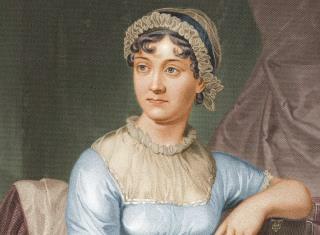 In honor of the 200th anniversary of the British author's death, Hampshire Archives in the UK plans to showcase two fake marriage entries Austen is believed to have written in a register in her home parish of Steventon, England, where her father was rector, when she was only a teenager. The announcements of upcoming marriages, written in the late 18th century, identify Austen's apparent betrothed as Henry Fitzwilliam of London and Edmund Mortimer of Liverpool, reports AFP. I feel so sorry for any woman who lived in those times. There were no real choices to be made about how to live at least in the western hemisphere and abominable lives were lived in the rest of the world. At least now we in the western hemisphere can enjoy dignity. Not so then. Kind of sounds like my grandmother. She was married 6 times, ran a boarding house, and hid illegals from immigration for decades. When she died in the early 90's, my dad had to untangle a mess of old liens and attachments.